"Part 1: Dogs, Birds, and a Wild Hare"
"Part 3: South of Pharr, Peachtree Hills, Bennett Street"
"Part 5: Castleberry Hill and Mason Murer"
I was ahead of schedule and in the gallery groove but I was a little tired. Time to bring it home, Decatur and Inman Park. Rose Squared Gallery and Framing was closed at 7:17p when I took this picture. The 3 gallerias "On the Square" in Decatur were busy. Worthmore Jewelers had the space, customers, and the interest so they became a gallery too. Here are "wearer of many hats"-Joan Wasser, Owner-Harris Botnick, and art director-Ashlei Thomas. Inside art on top, jewelry on the bottom with people all over. Now you know: Wild Oats and Billy Goats is a folk art gallery in Decatur, so there. The whole universe is inside. The Seen Gallery is on Church Street. As tired as I was, the gallery staff had also been on their feet for more than 10 hours on a "wawm" day. I salute them. Here are co-owners Bill Bibb and Amy Bradford who still had plenty of charm and good humor to encourage the now wilting Architecture Tourist, and a singing bird to boot. This is clay artist, Michael Klapthor with his witty "Shy Fox." My picture doesn't do it justice. Sycamore Place Gallery & Studios was party central on Sycamore Place. It was a batch of artist nooks with a big back room and patio. On the right is the Sycamore Place impresario Sylvia McCorkle. She charms in 10 seconds. Visit for an irresistible dose of life energy. This is an artist party space. The band and lady bodybuilders - really - had not even arrived. Now for a jag out to Avondale Estates and wonderful MudFire Clayworks & Gallery. Here are wife/husband co-owners Luba Sharapan and Erik Haagensen holding Luba's mugs. They were shutting down after 11 hours. 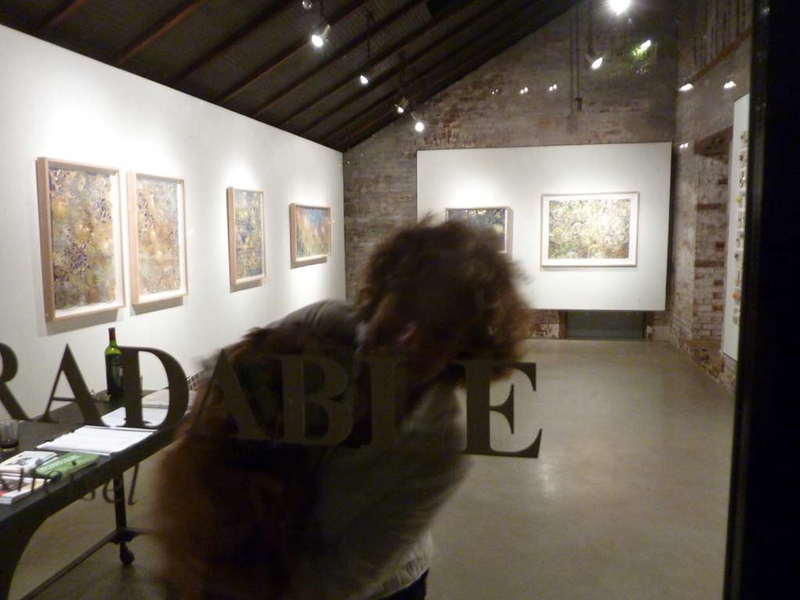 I'd done 34 open galleries and 3 closed galleries. I had one hour to visit one more. Per my plan: I wanted to hit whitespace in Inman Park about dusk. it was 9:30 and I had done it. Getting a little woozy now, not exactly art overload, one foot in front of the other. South to Castleberry Hill and Marcia Wood Gallery. Here is Marcia Wood herself. Marcia Wood Gallery on Facebook. I didn't see Mr. Besharat at Besharat Gallery but it's always breathtaking. The tilt lurks in the back of my mind. This piece stays with me. I must see it again: Jean-Francois-Rauzier "Bibliotheque Ideale 3," more than 1000 images Photoshopped together. This is a tiny detail, maybe 4"x6"
Detail from another work by Jean-Francois Rauzier. I had to backtrack a bit to Mason Murer Fine Art. They were hosting a grand exhibition / event that night. "No Limits: Celebrating Georgia Artists with Disabilities" Mason Murer on Facebook. They Tweet at @MasonMurer. On the left, Elizabeth Labbe-Webb Executive Director of VSA arts of Georgia who was mighty busy. There was an entire warehouse wall of art for sale. VSA Arts Georgia is on Facebook. This is going to take a few more posts. They started with "Part 1: Dogs, Birds, and a Wild Hare" "Part 2 Buckhead Galleries," and "Part 3: South of Pharr, Peachtree Hills, Bennett Street." This was the Atlanta Gallery Association Art Sun-up to Sundown – Citywide Art Walk Saturday, August 21, 2010 10 am – 10 pm. I think I did the very first Westside Arts District's Gallery Walk. Watson Gallery (formerly Abstein Gallery) is on 14th next to The Silver Skillet Restaurant. If you head around back, you might find Rebekah Watson herself. Watson Gallery is big, impressive and loaded. If you drive by you might miss it. From the Silver Skillet, you can see the side door, a colorful Zen View teaser. Please head around back. Alas, Tanner Hill Gallery, also in White Provision, closed just as I got there. I think they had to catch a plane. Here is their Facebook page. They've had some great shows though. Here is Thornton Dial at Tanner Hilll. Now I was one gallery behind so I substituted the Jackson Fine Art space at White Provision. They featured stunning, spooky pictures of children. They have a Facebook page. Ever been on 11th Street? Get This Gallery and Saltworks Gallery are side by side. Lloyd Benjamin, the Get This impresario, does framing. Get This Gallery feathered Harrison Keys in a solo show: Pressure Luck. ... and the urn with fur, not so easy to find in the Buckhead galleries. Here are Jeffrey Guy and Bob Butler owners of Twin Kittens. They sell art without taking commissions. Good deal I think. Very nice folks. I've "allowed" them to use my initials on their sign. I urge you to visit their Facbook page and "like" them. Emily Amy Gallery is a great space. There are several ways to move though the gallery. Gaps give you long sight lines and Zen Vews. Kiang Gallery was closed! Cool gallery anyway. 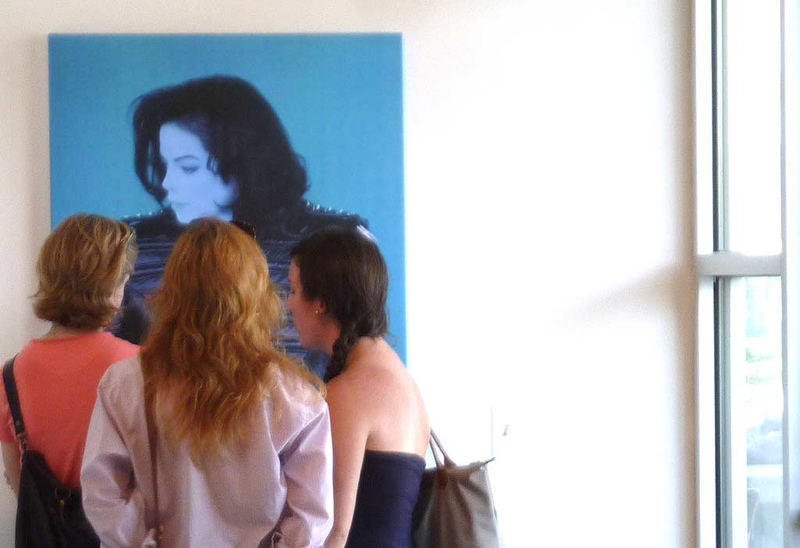 So I substituted the non-AGA gallery, Sandler Hudson Gallery now full of all blue Michael Jackson by Amalia Amaki. Stunning, strange, memorable. ACAC has room for huge indoor-outdoor parties and huge art. This is part of Shana Robbins' "Supernatural Conductor." Stange, feminine, and you can walk through some of the pieces. Shana Robbins used more lace than I've ever seen in one place. I need a little nap but I still have Mason Murer, Castleberry Hill, Decatur, Avondale, and Inman Park to go. This is going to take a few more posts. They started with "Part 1: Dogs, Birds, and a Wild Hare" and "Part 2 Buckhead Galleries." 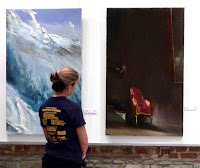 This was the Atlanta Gallery Association Art Sun-up to Sundown – Citywide Art Walk Saturday, August 21, 2010 10 am – 10 pm. I was getting warmed up. Grandview is a tiny street in Buckhead that has more than it's share if lifestyle stores crammed into little houses. The buffer zone between commercial and residential in south Buckhead is an interesting subject for another day. Grandview is home to the Atlanta Artists Center & Gallery "Founded in 1954 ... the oldest continuing artists organization in the area. With over 450 members from 10 metro Atlanta counties, we’ve become the largest all volunteer, non-profit (501c3) fine art organization in the Southeast." Folks were receiving art for their AAC 7th Annual National Show - 2010. Here is Charles Woodbery out front who was getting the job done. I did Miami Circle Next. First Reinike Gallery. Inside, owner / artist Charles Reinike had just completed this commission, a charming anniversary present. I wish you could see it up close. I was ready for a little nap by this time. Across the street: Vespermann-Cooper Gallery featuring glass and more. I like this folky clay "Dreamsong" by Martha Hall. There were 3 AGA galleries on Peachtree Hills. First the Hagedorn Foundation Gallery featuring photography. They have a Facebook page. For you design bloggers Hagedorn will feature THE SARTORIALIST August 31 - September 25, 2010. Almost next door is the stunning TEW Galleries which is not just an art gallery but a stunningly beautiful space. I met Timothy Tew himself. Here is the TEW Galleries Facebook Page. The David Gallery/Painting Exchange matched painting to umbrella, a great effect. This one said beach to me. Artist Beverly Molander was minding the store for David. Then I made a quick jaunt to Bennett Street and Ann Irwin Fine Art. Here is their Facebook Page and blog. Kathryn's father and Suzanne Economopoulos helped Kathryn get the digital pictures together for the gallery. Whew, I'm not even halfway done. 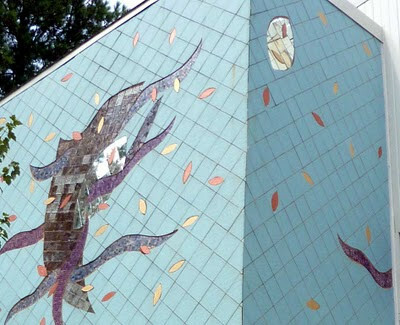 Next time you visit ADAC don't miss this stunning mosaic at the Peachtree Hills Rec Center. Anyone know the artist? I blogged about Ms. Surlin's mosaic at the Kirkwood fire station. This one is watery too.